Sipekne'katik band Chief Rufus Copage and the Shubenacadie. In the fall of 2014, construction started on a brine discharge pipeline next to the Shubenacadie River, an hour north of Halifax. The development, by a company called Alton Gas, hadn’t yet received full government approval, and it was met with swift protest. A camp was soon erected that was largely occupied by local Mi’kmaw protesters. For many, this was not only the first time hearing of the Alton Gas project, but also their first realization that components of their elected band leadership had known of the project for years. The Mi’kmaq Rights Initiative (KMKNO), the organization which claims consulting authority for 12 of the province’s 13 Mi’kmaw communities, had been aware of the project and engaged in consultations with the Nova Scotia government and Alton Gas since 2006. 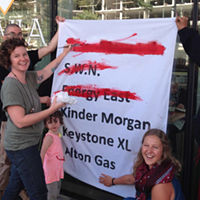 But in 2014, during the protests, the KMKNO publicly asserted that Alton Gas and the province had not yet fulfilled their consultative requirements in terms of compensation plans and demanded the project cease until such obligations were met. Alton Gas was stopped cold—for about a year. In January, 2016, the province declared the consultations complete and gave Alton the permits to continue its work. KMKNO, which had long been an active partner negotiating terms of compensation from the project, could do little more than accept the province’s decision. But some of the locals weren’t interested in a deal with Alton Gas: Disturbed by the project’s potential environmental impact, they wanted the project stopped altogether. The Sipekne’katik band announced this week they would file an appeal with Nova Scotia’s environment minister because of a perceived insufficiency in consultation with the band. At least two other local groups are planning similar appeals, The Coast has learned. Sipekne’katik band councillor Alex McDonald says the appeal will be filed prior to the province’s February 19 deadline. On its surface, that’s been the struggle for residents of a rural patch of Nova Scotia to stop—at least peacefully—a major corporate gamble on natural gas prices. Underneath those conflicts, there’s the story of how an energy behemoth has subtly infused itself into the province over the last eight years, paying for the very scientific studies that would approve its work while the public knows very little about what it means for the community and the Shubenacadie River ecosystem. Devastating environmental impact, or a drop in the bucket? We don’t know. And that’s a problem. From fracking to processing to cross-Canada pipelines and all the way to home delivery, the Calgary-based AltaGas Ltd., through a variety of subsidiaries, has built itself a natural gas empire. Financial experts The Motley Fool have called AltaGas “a unique beast in the energy sector,” which has quietly weathered the recent energy sector tailspin—relatively, mind you—by owning and controlling a diversified portfolio, spanning all sectors of the liquified natural gas (LNG) business. On any given summer day in Halifax, almost wherever you see a road being dug up and repaved, linger awhile and you’ll see an AltaGas subsidiary—Heritage Gas in this case—ever-so-slightly expanding the parent company’s empire by adding in home-delivery pipelines, one upended residential street at a time. But the LNG giant is also eyeing a far bigger prize than residential infrastructure. Its proposed salt cavern-hollowing, LNG-storing, brine-disposing project in rural Colchester County is a potential game-changer. The only one of its kind in the area, it will service a base of Halifax-centric customers. But it will also link into the border-hopping Maritimes and Northeastern Pipeline and allow AltaGas to tap into the almost-limitless American Seaboard market. According to a study conducted by Kaminak Resources Ltd., AltaGas has had its eye on the possibility of salt cavern storage in the “Stewiacke formation” since at least 2005. These caverns, of which there are plans to drill anywhere from four to 18 or more, will be dug out of a naturally occurring salt formation between 800 and 1,000 metres underneath the rural community of Brentwood, Nova Scotia. Functionally, the caverns will be hollowed out of the salt formation using a controlled brining process. A well will be drilled into the underground salt and water will be injected into the formation, thus creating a brine solution. The walls of the newly brined cavern are then leached, the brine is extracted, et voila, a salt cavern is born, ready to store natural gas. But that initial cavern proposal may only be the beginning. According to a presentation prepared in 2013 by ICF Consulting Canada Ltd., while under contract to the Nova Scotia Department of Energy in 2013, when completed the caverns will have an initial storage capacity of four to six billion cubic feet, with the potential to expand to upwards of 20 billion cubic feet and more. That could meet the full energy requirements of 220,000 homes for one year, and provide storage services for both the Maritimes and New England. It could also—given the vast boundaries of the Hydrocarbon Storage Area Lease provided to Alton Gas by the Department of Natural Resources—turn a corner of rural southern Colchester County into one massive underground natural gas containment field. Eighteen gas caverns may only be a start. 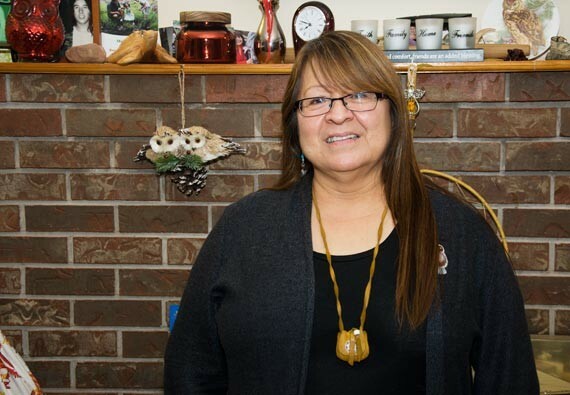 Sipekne’katik First Nation member Dorene Bernard is opposed to the Alton Gas project. The province’s official line is that the Alton Gas caves will save natural gas customers $17 million each year. The $17 million line appears to be attributable to Michael Sloan from the same ICF Consulting, when he was retained as an expert witness by Heritage Gas and brought before the Nova Scotia Utility and Review Board in 2015. It should be noted that Sloan has a track record as a pipeline and natural gas-friendly expert witness for hire. Even if the $17 million in local savings is true, that’s throw-away money compared to the potential profits to be made in New England. The long-term potential of dozens more caverns—allowing natural gas to be purchased and stored at summer prices, then sold during winter months to New England at a price still cheaper than whatever gas is coming in via winter pipelines—could be immense. First Nation members, fishers and environmental advocates have stood against this mighty plan, without much support. An October 21, 2014 Brentwood protest drew only passing, local media interest. Two days later, Stewiacke Town Council visited with representatives from Alton Gas and endorsed the project with open arms. 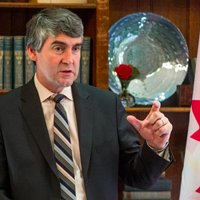 Likewise, provincial and federal governance structures have also been on side with the project, with AltaGas repeatedly lobbying Nova Scotia MP Geoff Regan and lobbying Scott Armstrong, former MP for Cumberland-Colchester-Musquodoboit Valley, in the lead-up to the 2015 federal election. Lobbyists now in the AltaGas/Alton Gas stable include Karen White, former communications director at the Nova Scotia Department of Energy, as well as Tim Church, a former senior advisor to the Canada-Nova Scotia Offshore Petroleum Board, and special assistant to the federal departments of Natural Resources Canada and the Ministry of Fisheries and Oceans. The only real fly in Alton Gas’ ointment is the unique manner in which they have proposed to deal with the ensuing millions upon millions of litres of brine that stand to be produced through their cave carving process. 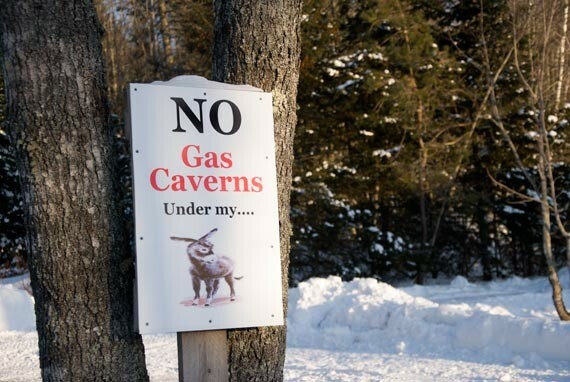 To hollow-out said caverns, Alton Gas has proposed to divert water from the mighty Shubenacadie River and run it through an approximately 12-kilometre pipe, leading to the cavern site. The ensuing brine is estimated to be in the realm of upwards of 260 parts per thousand (ppt) salinity. Seawater is about 30 to 35 ppt (or 3.5 percent salt). The produced brine will then be piped back to the river and stored in a “brine pond,” then diluted to 28 ppt before being reinserted into the tidal estuary. 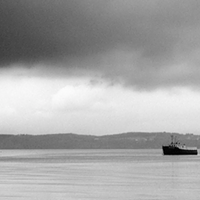 The hope is that the river, with its massive tides, will simply rush the brine out into the Cobequid Bay and beyond. At full operation, estimates put the amount of brine to be pumped into the river, on a daily basis, to be about 10,000 cubic metres, or roughly four olympic-sized swimming pools of brine. By comparison, the Shubenacadie’s monstrous tides move five million cubic metres of water twice daily. What impact would that much brine have on the Shubenacadie’s ecosystem? The Nova Scotia Department of Environment and Labour, along with the federal Department of Fisheries and Oceans, wanted to find out. In 2007 those departments found Alton Gas’ initial Environmental Registration for the project did not sufficiently address the potential risks the brine disposal might have to Shubie fish and fish habitat. For that to be remedied, someone would need to start counting striped bass. Jim Duston is a professor of finfish aquaculture in the department of plant and animal sciences at Dalhousie University’s Truro campus. Duston, a lab-based scientist by trade, has been working since May 2007, in conjunction with Truro’s North River Fish Farms, towards turning Shubenacadie striped bass into a viable farmed fish resource. He’s also supervised three student theses in the early 2000s, related to potential environmental impacts on striped bass larval survival rates. After salmon and sturgeon couldn’t be found in initial searches, the striped bass quietly became the poster species by which the safety of Alton Gas’ project would be measured. Given his lab-based history, it wasn’t surprising that Duston would be tapped for his expertise. By 2008, he was leading a research group, operating under the multi-faceted name Striped Bass Research Team, that was tasked with gathering information on the spawning characteristics of Shubenacadie striped bass. Funding for the project came from Alton Gas. “We’ve had a contract with [Alton Gas] every time since that year to conduct monitoring in the Shubenacadie River to understand and quantify fish, mostly fish,” Duston tells The Coast. In effect, the company was beginning to fund the studies it needed to satisfy the DFO and the province. Duston also notes that the funding, and his ability to harvest striped bass eggs at liberty, secondarily benefitted his aims of developing a viable on-shore striped bass industry. In today’s world of industry-funded academia, this scenario is not such an anomaly. But it does bear noting. By 2010, Alton Gas began funding master student research, under Duston’s supervision. The funding was earmarked towards further studying the potential impacts of their brining discharge plans upon striped bass eggs and larvae in the Shubenacadie River. Alton Gas’ first paid-for thesis, undertaken by Craig Reesor between 2008 and 2012, appears to have grave misgivings about the potential impacts of the brine pipe. Among other concerns, Reesor suggests that altering the brine content of the river might mess with the bass’ olfactory system, and the intake pipe may cause physical damage to the striped bass eggs and larvae. 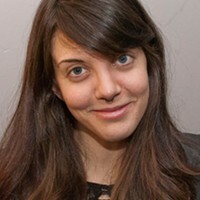 The second thesis, undertaken by Gina MacInnis between 2010 and 2012, found that striped bass seem to withstand a wide range of variability in salinity, water temperature and tidal force. This was at last good news for Alton Gas. It suggested striped bass eggs could be hearty enough to withstand the brine. MacInnis, who did not respond to repeated requests for comment, would upon completion of her Alton Gas-funded master’s thesis be hired as an environmental consultant by the company. In 2010, Duston, along with his former master student Adam Cook (now working for the DFO) and Rod Bradford (another DFO employee) produced a lab-based study on the effects of salinity upon Bay of Fundy striped bass eggs and larvae. The Cook et al study experimented with the success rates of striped bass eggs when exposed to salinity increments of zero, two, five, 10, 20, 30 and 35 parts per thousand, with a variety of temperature settings thrown in. The study found striped bass eggs and larvae survive fairly well in concentrations up to 20 ppt (“survival was close to 70 percent”), but show marked signs of mortality in the 30 and 35 ppt mixtures (where survival rates are “significantly reduced to 47 percent”). A sign in Brentwood, Nova Scotia. This research study is essentially the bible on the effects of salinity levels on Shubenacadie striped bass, and one of the principle reasons that Alton is holding its brine discharge to 28 ppt. There’s only one problem: The study did not test the eggs or larvae at any salinity increments between 20 ppt and 30 ppt. At some point between those two increments survival rates drop 23 percent, but no one knows where exactly to place that toxicity tipping point. According the Reesor’ and MacInnis’ thesis fieldwork, the natural salinity levels in the vicinity of the brine discharge pipe can vary from zero to just over 20 ppt. Nowhere did the two masters students find levels of 28 ppt. While Alton Gas was paying for his students’ work, Duston was also gathering data on a wide variety of other fish species that inhabit the Shubenacadie tidal estuary. These include, but are certainly not limited to: Atlantic salmon, Atlantic sturgeon, American eels, shad, gaspereau and tomcod. Duston and Alton Gas both claim that this data, gathered between 2008 and 2015, shows that the project’s brine discharge will have minimal impacts upon the natural environment and will not impact the species contained within their studies. But that data remains behind closed doors. Aside from an extremely brief synopsis posted to Alton Gas’ website, the raw data itself has not been made available for scientific scrutiny. Nor have the techniques used to gather this data. Nor has the timeline of data gathering. In effect, the public is expected to take Alton Gas-funded research at face value, without even knowing how or when the data was gathered, or even what the data says. “Early on, we started asking those types of questions from Gina MacInnis and Jim Duston, like what other information was out there, and for the results of this seven-year preliminary, background work,” says Trevor Avery, a marine biologist at Acadia University who sat on Craig Reesor’s thesis advisory committee. “The answer to that, at the time, was they they had collected everything in beach seines. But none of that information has come out in a thesis or anything. Sober second thoughts about using beach seining to gather credible data—and drawing wide sweeping inferences from said data to promote industrial projects—exist in abundance. Duston says that the DFO, as well as third-party consultants, have seen the data. But the first crack that the public will have at actually viewing it will be when it is published academically, potentially after the brine discharge gets started. Without being able to see the data, Rutherford’s comments suggest that Duston’s beach seining found no tomcod eggs—and so the company feels safe concluding there are no tomcod eggs in the Shubenacadie River. Ever. The Mi’kmaq name for the first moon of the new year—Penamujuiku’s—translates roughly into Frost Fish Moon or Tomcod Moon. 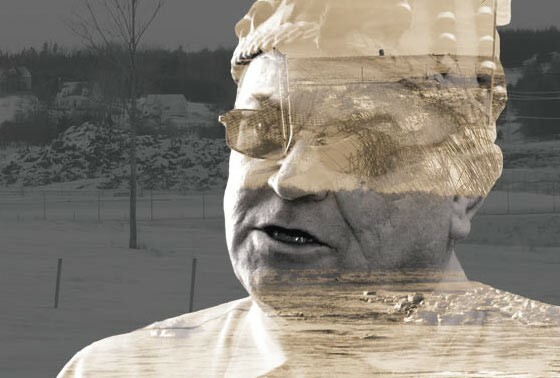 For hundreds upon hundreds of years before Duston’s team didn’t find any tomcod eggs or larvae in the Shubenacadie river estuary, the local Mi’kmaq felt the annual tomcod spawn was an important enough event to name an entire lunar cycle after it. Tomcod spawns in the Shubenacadie estuary in mid-January, a time period when Duston’s hypothetical beach seines and plankton nets were likely put away for the winter. Even if they were still being used, one need only visit the Shubenacadie in mid January to contemplate how ineffective a beach seine would be against the onrush of thousands of pounds of massive, churning, muddy slush. In July of 2015, a third-party study—requested by the KMKNO and undertaken by Conestoga-Rovers and Associates of Dartmouth—was released which found misgivings in the existing data gaps surrounding the project and potential impacts upon the estuary and striped bass eggs and larvae. The study suggested ongoing monitoring of Alton Gas’ impact, as it played out. The task of said monitoring falls back into the hands of Jim Duston, Gina MacInnis and a third student at Dalhousie University. The KMKNO had demanded a third-party study, and had received it. The study itself certainly did not endorse the proposed project. Yet that was all there could be, and a November, 2015, KMKNO newsletter reflected a newly-complacent tone. The project was to be a go, as far as they were concerned. The Sipekne’katik First Nation, which stands to be among the most impacted by Alton Gas’ effects in terms of proximity and use of the Shubenacadie River, has been undertaking its own consultative arrangements with the province independent of the KMKNO, a governing body it withdrew from in 2013. But the end result has been the same. On January 6, 2016, the province wrote Mi’kmaq band councils, asking for any final input into the Alton Gas project to be submitted by January 18. On January 12, the Sipekne’katik and Millbrook First Nations requested that the project proposal be allowed to be taken to a community referendum. The province, laying bare the foundations of its consultative arrangement with the Mi’kmaq, informed band councils that they had no right to a referendum, and no right to a veto of the project. “We tried to have a referendum and the province won’t allow us to have that,” echoes Sipekne’katik Chief Rufus Copage. “So technically, how are we being consulted? The frozen shores of the Shubenacadie River. Miles Howe is looking forward to spending some summer afternoons along the banks of the Shubenacadie River in 2016. A recent conference on Indigenous livelihoods highlights the struggles and progress of Indigenous fishers dealing with the federal government. The pipeline project’s sudden death was announced Thursday morning. HIFF, hip hop and halva await.